So, the facty bits. 253 is named for the number of seats on a standard Bakerloo Line tube train: seven carriages of 36 seats each, plus one driver up front. Each passenger gets their own page of story, limited to 253 words per entry (not counting footnotes), and arranged in three sub-heads: ‘physical appearance’, ‘inside information’, and ‘what [they] are doing or thinking’. There are footnotes: some pertinent and logical, some digressive and orthogonal. The print remix also has lots of po-moroborous extra material that both mocks and celebrates its own ironic lampooning of itself: adverts for non-existent products and services, witheringly sarcastic exhortations to become a writer, that sort of thing. In true metafictional tradition, Ryman himself appears as passenger 96, the fall-guy of a guerilla theatre troupe. And as an added bonus – especially for me – another passenger is reading a copy of Vurt by Jeff Noon. 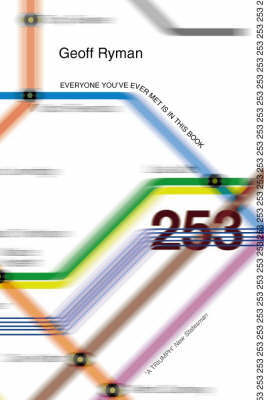 The timeline is restricted to the few minutes between one station and the next, and the strict wordcount limit means that bringing in the external lives of the characters can only be done briefly; the narrative of 253 is momentary, collective and emergent, but it reaches out into the world beyond the train through the connections between some of the passengers – perhaps they work in the same place, or are pondering a similar topic. In the online version, many (though not all) of these are clickable links; with the print edition, the reader constructs them by progressing through the book and remembering previous characters. 253 isn’t an sf novel, but those familiar with Ryman’s work will recognise the keen eye for workaday tragedy and moments of personal transcendence he brings to the story. At turns bleak, uplifting, sad and silly – changing tone with the turn of a page – I was quite astonished at how much affect Ryman wrings out of the form. While reading it (which often took place on tube trains, though never the Bakerloo – doesn’t go anywhere I ever need to go, that one) I had some actuLOL moments, as well as a fair few where I had to blink away a suspicious stinging in the eyes. If anything, its temporality – rooted as it is in a very specific point in history – is its greatest strength, offering a snapshot of London and its people in 1996, as the fag-end of Thatcher’s reign burned right down to the filter. I am very interested in constraints as a writing tool; not only do they erase the fear of the blank page to some extent, but they can produce unexpected and interesting results. 253 is a wonderful example of this in action. For one thing, the need to follow themes and create links unexpectedly generated ideas for characters. “For example, somebody works in a dry-cleaning shop and has decided she can’t do that so she’s learning how to be a taxi driver, so you say, how can I have a link with taxis? How can you have anything link with taxis on the tube?” He found a way: a character who’s come up with an automated system to install in cabs that would replace The Knowledge — the encyclopedic mental database rookie drivers of London’s black cabs spend years mastering in order to get a license. The 253 print remix provides you with an off-the-shelf reading strategy, and in the process reveals the linearity inherent in the novel. After all, it’s set on a train – and what could be more linear than a train, with the driver’s cabin up front and a neat succession of carriages following along behind, one way only, please mind the gap? Reading the print edition from front to back allows the emergent and branching subnarratives to accrete in the mind, as if your brain were caching the pages to which you’ll find yourself linked later on; reading from front to back means you can be certain that you’ve read the lot and not missed anyone (or anything); reading from front to back also suggests strongly (to me at least) that it may well have been written from front to back, and coded for hypertextuality after completion. I was surprised at how effective a novel the print version is, though the few contemporary reviews I can find online suggest that 253‘s bitty and piecemeal structure was off-putting for others. However, the narrative experienced when reading is a collaboration between writer and reader, and form influences the work that emerges from that partnership. And so, one must assume, do paradigms and schemas of narrative; so, how much of my feeling that 253‘s original/”natural” form was linear is a function of me having been raised as a reader of linear narratives delivered in a linear medium? Would a web-native Millennial find the book baffling and dull, preferring instead to skip around within the online text, guided by the links and their whimsy, uncaring of whether there were good bits they’d passed over, or something vital they’d missed? In other words, I’m wondering whether Ryman’s assumption that the medium changes the experience is not, with hindsight, slightly backward; perhaps it’s familiarity with the medium that modulates the experience. Previous PostDescending OlympusNext Post23 skidoo! What you’re describing in the last paragraph sounds remarkably like Interactive Fiction to me. You’re probably aware of it through Jonathan if nothing else but Analog: A Hate Story from Christine Love has players trawling text logs via a damaged starship AI to try and unpick a larger narrative, with the bulk of the entertainment derived from exploring the individual stories and lives of the ship’s now-dead crew and how they overlap and interact, all the while searching for the key bit of information that will allow you to unlock a new set of logs.